Hikaru Nakamura is a four-time USA Champion and one of the top ranked chess players in the world. Born in 1987, Nakamura is know as the “H-Bomb” because of this straight-out style of game. He always plays for victory and never offers a tie. In addition to being a successful player in traditional chess, Nakamura has also had great success in chess variants such as Blitz Chess, Chess Pool and FischerRandom. He is the author of “Bullet Chess: One Minute to Mate” and “Pool Chess: One Minute”. When FIDE in May 2014 began publishing official ratings for rapid chess and blitz chess, Nakamura was #1 on both lists. Nakamura’s highest USCF rating so far is 2882, attained in July 2012. Hikaru Nakamura lives in Missouri, USA. His hobbies includes tennis, mathematics, history and financial markets. He twitters at @GMHikaru. Hikaru Nakamura was born in Hirakata, Japan on December 9, 1987. His father, Shuichi Nakamura, is Japanese, while his mother, Carolyn Weeranmantry, is from the United States. When Nakamura was two years old, the family moved from Japan to the United States. A year later, Nakamuras parents divorced. Nakamura began playing chess before he had turned five. He was coached by his stepfather Sunil Weeramantry, a FIDE Master and chess author from Sri Lanka. Hikaru Nakamura attained the title chess master from the United States Chess Federation at the age of 10 – a record breakingly young age. In 1999, twelve year old Nakamura received the Laura Aspis Prize, an annual prize awarded to the top USCF-rated player under age 13. In 2003, Nakamura became a grandmaster. He was then 15 years and 79 days old, making him the youngest U.S. player ever to become a grandmaster. (The old record was held by Bobby Fischer, who was three months older than Nakamura when he became grandmaster.) In 2010, Nakamuras record was broken by Ray Robson. Nakamura spent the summer of 2009 in Europe, playing in a series of tournaments with great success. He did for instance emerge victorious from the San Sebastian tournament, and in the German town of Mainz he won the unofficial FischerRandom World Championship. In the following year, Nakamura reach the top-10 of the world rating list. He won the Wijk aan Zee (Tata Steel) with 9 out of 13. In a six game match held in Saint Louis, Missouri, Nakamura defeated the FIDE World Champion Ruslan Ponomarey. Nakamura won the 2011 Tata Steel Group A. 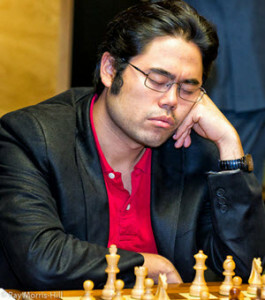 At the time of writing, Nakamura is a four-time USA Chess Champion. He has represented the United States at five Chess Olympiads, winning two team bronze medals.